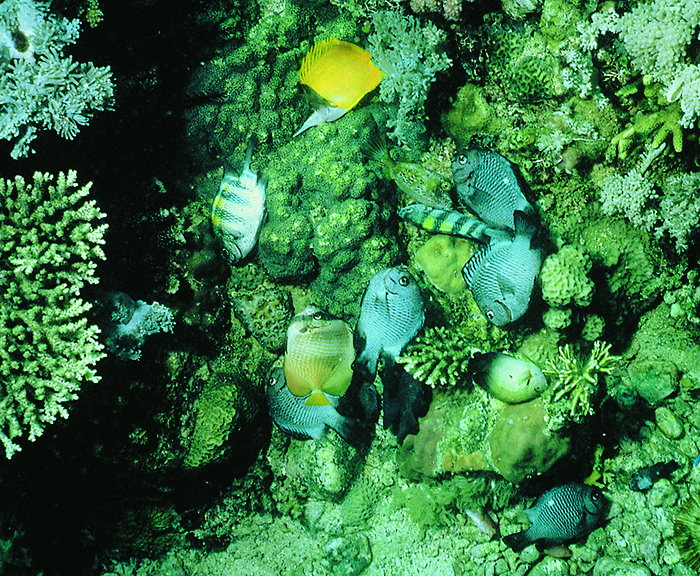 Reef fishes stunned (or fatally poisoned) by cyanide fishing in the Philippines. Image: Lynn Funkhouser/Microcosm. National Geographic has published a new report by CORAL Senior Editor Ret Talbot taking a look at cyanide use in collecting marine aquarium fishes and the concerns now being raised about the highly-praised cyanide testing protocol, first published by researchers at the University of Aveiro, Portugal, in 2012. This methodology was, until recently, widely touted as a possible solution to the ongoing problem of detecting cyanide exposure among coral reef fishes collected and exported into the worldwide aquarium trade. However, after several years of investigation and trying to validate the test, a scientific team led by Dr. Andrew Rhyne found themselves surprised, stumped, and left questioning everything. When the fundamental biochemical math was reexamined, researchers realized that the entire premise may be flawed. The latest findings out of Roger Williams University (RWU) refute the validity of the lauded cyanide test and undermine all subsequent data that was produced utilizing the methodology. ‘Holy Grail’ Test for Illegal Cyanide-Caught Aquarium Fish May Be Fatally Flawed, by Ret Talbot. Read now at National Geographic. This new National Geographic publication expands on what was initially released by RWU, and is the latest installment in this developing story. Moreover, Talbot discussed the latest findings with Dr. Ricardo Calado, one of the authors on the original 2012 paper, and Miyoko Sakashita, Oceans Director and Senior Counsel the Center for Biological Diversity (CBD), which utilized research findings based on the Portuguese cyanide test to condemn the aquarium trade—findings that may now have to be retracted, raising questions about how the data were obtained in the first place. CBD reacts somewhat diplomatically to the new contradictory findings. Calado, Talbot reports, continues to defend the original work. Both Calado and Dr. Rhyne (an author of the latest RWU findings) go on the record saying there is more to come. What’s next? 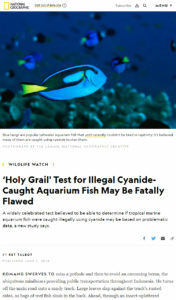 To read more, see Ret Talbot’s article on National Geographic’s website: “Holy Grail” Test for Illegal Cyanide-Caught Aquarium Fish May Be Fatally Flawed.